“Our client was a disabled wheelchair user, an ex-Hollywood movie stuntman that had commissioned FWA Luxury Homes to build a 21st century, accessible home for him. Naturally our client wanted to join us on site fairly frequently in order that he could realise real-time progress updates and have a proactive hands-on role in maximising the comfort of what was to become his new luxury home. Of course legislation requires visitors to be appropriately dressed and ‘kitted out’ whist on site (hard hats and high visibility clothing etc.) 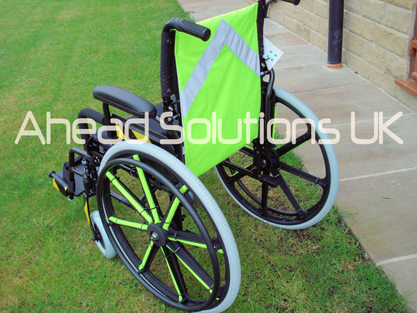 Since our client was a permanent wheelchair user, I approached Ahead Solutions UK Ltd. and tasked them with ‘upgrading’ a standard wheelchair so that it complied with legislation; was easily seen, yet was adaptable in that the hi viz could easily and quickly be removed when necessary. A bespoke fluorescent & back panel with high-visibility chevron. The above featured strong neodymium magnets sewn in so that the back panel could be attached and removed quickly. Made-to-fit soft fluorescent tubular fittings for the wheelchair spokes. Various other high visibility trims strategically yet appropriately fitted. Hi Viz Wheelchair developed for FWA Luxury Homes, Essex.